Pictures and photographs implicitly convey a narrative—and that makes them ideal writing prompts for generating new short story ideas. You can use a picture as a writing prompt in a solo exercise or with a class or writing group. 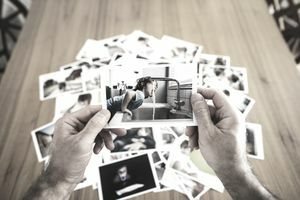 If doing the exercise in a group, you can either have everyone use the same picture, or you can have a selection of unique images for each writer. Consider having each student or group member bring in a picture and trade with someone else. The picture can be a personal photograph, a clipping from a magazine or just about any image that that has the potential to inspire. Whether you do the exercise alone or in a group, it will either stir your creative juices and get you to explore new themes, or, in a group, help break up the routine and build cohesion. Have everyone spend 10 to 15 minutes free writing on the photograph. Choose one aspect (or theme) of your free writing exercise as a starting point for a short story. The story does not necessarily have to explain the picture, as long as the picture has in some way inspired the resulting work. Have everyone share the stories (either that day or the next time the class meets) along with the picture, explaining how the picture resulted in the written material. For those who wish to continue developing their story, you may want to check out articles on plot, dialogue, and character. Don't worry about conforming to the photograph in a literal sense. The point of the exercise is to get you started writing and, ideally, to write about something you would not otherwise have written about. You can also do this exercise on your own by opening a magazine and randomly selecting a photograph or asking a friend to select a photograph for you. Or, select an image from something you saw that morning. Don't write about something you've written about before just because it fits the picture. The point of the exercise is to trigger you to write something entirely new. Don't worry about needing a lot of supplies for this exercise. All you'll need is an image, pen, and paper or whatever digital device you prefer.